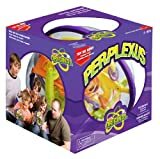 We love the new Perplexus, a new toy from Plasmart that takes the old Brio Labyrinth to the third dimension. 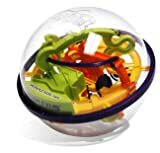 Perplexus is a clear plastic globe, with a labyrinth inside. It requires turning the 1 foot in circumference ball over and over to move the ball through a series of maze boundaries and obstacles. Perfect for developing space and motion skills in a six year-old or 40 year-old, this is a toy you and your kids will fight over. Blissfully, turns are very short since it’s hard to keep the ball in play before it falls off a ledge. That doesn’t mean that it’s too hard to be fun. Each challenge is eventually easy to overcome and the player keeps on learning the trips and traps until eventual success. This toy is a winner! We had a chance to meet the inventor, a sculptor/designer, who crafted the entire game by hand. He even had “life-size” four foot tall version to show us, and lovingly explained each challenge in building a one-of-a-kind toy like this. We also talked to Plasmart’s President, Tim Kimber, who also launched the PlasmaCar, a favorite of ours from two years back. We liked the Plasma Car when we first saw it at ABC Kids Show, and I think we can count on Plasmart for a lot of innovative toys in the future. $24.99 for one or get the two-pack!